1Mix together the flour, stevia, baking powder, salt, and cinnamon (dry ingredients). 2In another bowl, mix together the agave nectar, vegetable oil, almond milk, and the egg (wet ingredients). Pour into dry ingredients bowl and mix by hand. 3Fold in apples to the mixture of dry/wet ingredients. 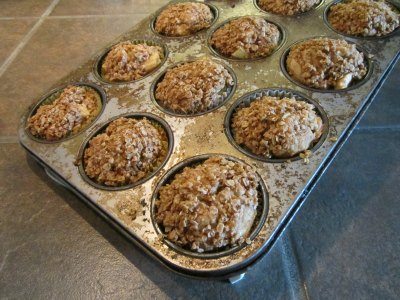 Drop into muffins trays (you can choose to use paper muffins inserts if you like, I did in the above video). Preheat oven to 400 degrees. 4In a medium bowl, melt the butter in the microwave (we used whipped butter, but normal butter will work too). Mix with cinnamon, stevia, and oats. 5Drop topping onto unbaked muffins. Spread evenly, covering the tops of each (it will push them down a bit, that is okay). 6Bake muffins in oven for 20-25 minutes minutes until golden brown. Test with a toothpick to see if they are done. If it comes out clean, the muffins are ready. Keep in mind that it might not be completely dry because of the apples; that is okay as long as the batter is cooked.